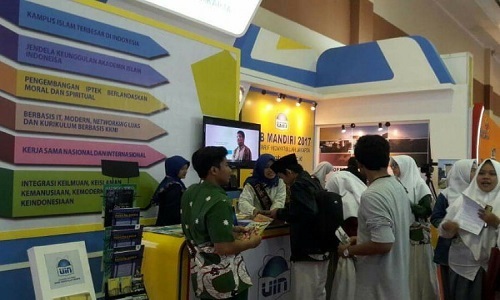 Main Auditorium, UIN News Online – UIN Jakarta held the 101st graduation ceremony for 1005 graduate and post-graduates, Saturday-Sunday (August 20-21th 2016). The event took place at Harun Nasution Auditorium, Campus I UIN Syarif Hidayatullah Jakarta, Jl. Ir. 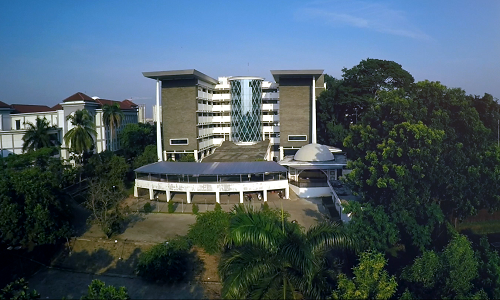 H. Juanda No. 95, Ciputat, South Tangerang. The event starts at 07.00 AM and followed by all graduates from the Faculty of Daâ€™wah and Communication (81 people), Faculty of Syariâ€™ah and Law (92 people), Faculty of Ushuluddin (45 people), Faculty of Social and Political Sciences (91 people), Faculty of Science and Technology (107 people), and Faculty of Medicine and Health Sciences (84 people). For the second session which is held on Sunday (8/21), the ceremony is followed by all graduates from Faculty of Tarbiyah and Teachers Training (281 people), Faculty of Adab and Humanities (40 people), Faculty of Dirasat Islamiyah (25 people), Faculty of Psychology (31 People), Faculty of Economics and Business (117 people), and 14 people from SPs (UIN Jakarta post-graduate school). As many as 15 people are chosen as the best graduates based on their GPA (Grade Point Average). 12 Graduate from S1 program, two graduates from S2 program and one graduate from S3 program. They were: Nurjanah (FDI) with 3.85 of GPA, Fathu Hidayat Rahmatullah (FISIP) with 3,90 of GPA, Ajeng Namira Putri (FPSI) with 3,43 of GPA, Nanang Rosidi (FU) with 3.85 of GPA, Ade Rachma Islamiah (FKIK) with 3.79 of GPA, and Berliani Ardi (FAH) with 3.82 of GPA, Dina Mardiana (FEB) with 3.86 of GPA, Fadil (FST) with 3.87 of GPA, Hanifah Arbiâ€™atun Nisa (FDIK) with 3.87 of GPA, Dede Puji Setiono (FITK) with 3.86 of GPA, and Aisyah Yusriyyah Ahdal (FSH) as the best graduates from S1 program with 3.99 of GPA. For the post-graduate program, the highest GPA is achieved by Farit Afrizal (S2 FU) with 3.72 of GPA, Ryan Bianda (S2 FDI) with 3.94 of GPA, and Sansan Ziaul Haq (SPs) with 3.74 of GPA. And the best graduate for the Doctoral program is Izza Rohman (S3) with 3.83 of GPA.